I bought a couple of flavoured gelatin because there's one more box sitting in our cupboard for a while now and I wanted to use it before it expires. The reason behind the additional gelatin is because I want to try out a dessert called Cathedral, whereby the interplay of colours of the gelatin is reminiscent of the stained glass windows in churches. Obviously, the more colour you have the better but I wanted to try out only a small portion for now, and become more ambitious later on. So I have a green and a yellow, plus the unflavoured, colourless gelatin at home. Four colours will be more attractive, in which case just double the amount of the other ingredients I have mentioned here. It also helps a lot to have a proper gelatin mould as these are designed to help you easily get the finished product out. Cook the coloured gelatin as per instructions. Cut into cubes (a different container per colour) then set aside. Combine boiling water, sugar, and unflavoured gelatin in a bowl and mix thoroughly. 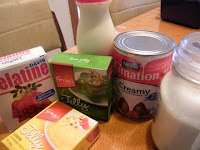 Add the evaporated milk and cream and continue mixing until well blended. Now on to assembling the dessert. The tricky part is how to properly distribute the colours in the mould. 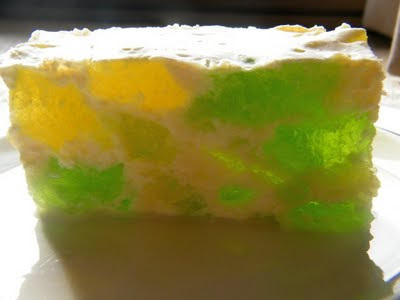 I suggest placing a layer of the mix into the mould first, then randomly place gelatin cubes. 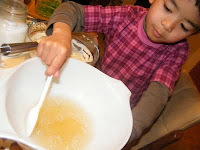 And then add another layer of the mix, followed by more of the gelatin cubes. And so on until the mould is filled. Refrigerate until set. Serve and enjoy. The next time, I would like my Cathedral Jelly to be completely transparent so I will skip the milk and cream. Will post the results when I get the chance to make it.